Join the UofL Sustainability Council in marching across campus to promote sustainability during the 2017 Homecoming Parade! Those interested in helping design and build our entry in advance should contact Brian Barnes (502-338-1338). 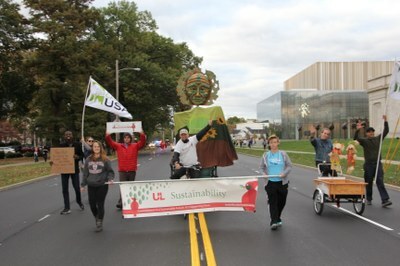 But all are welcome to come and walk or bicycle with our Sustainability contingent during the parade - simply find us in the staging area (the parking lot next to Kurz Hall at 4th & Cardinal) between 5-6pm on Friday, Oct. 13th. All sustainability-themed costumes, signs, and other visuals are welcome and encouraged! We are the defending champs, having won the 2016 Best Campus Organization award at last year’s Parade! Connect with us, share your ideas, and let us know you're coming on Facebook.